Do you need an offer? Do you need a written offer before ordering? Attention, this does not create or send an automatic order! The FRDM-K64F is an ultra-low-cost development platform for Kinetis K64, K63, and K24 MCUs. The FRDM-K64F hardware is form-factor compatible with the Arduino™ R3 pin layout, providing a broad range of expansion board options. 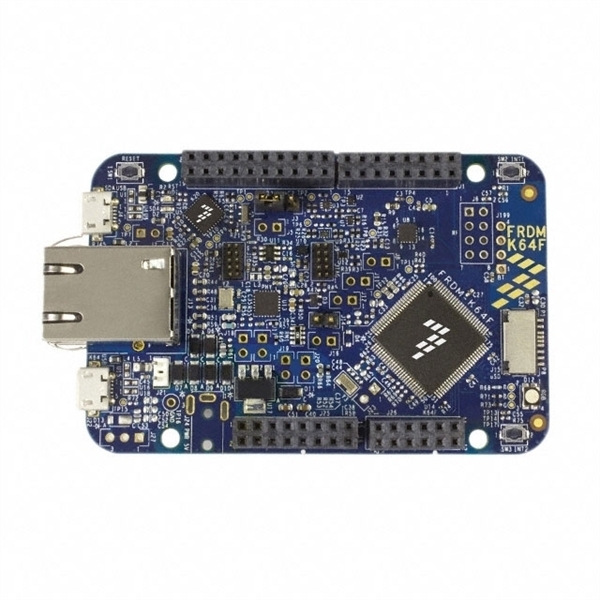 The FRDM-K64F is feature packed with a lot of peripherals to enable rapid prototyping, including a 3-axis digital accelerometer and magnetometer to create full eCompass capabilities, a tri-colored LED and 2 user push-buttons for direct interaction and feedback, expansion memory with a microSD card slot, and connectivity options using onboard Ethernet port and headers for use with Bluetooth and 2.4 GHz radio add-on modules. The FRDM-K64F platform features OpenSDAv2, the Freescale open source hardware embedded serial and debug adapter running an open source bootloader. This circuit offers several options for serial communication, flash programming, and run-control debugging.